A native of Pittsburgh, Pennsylvania, Kerry Kavalo currently serves in the Edmonton Symphony Orchestra. Prior appointments include Assistant Principal Viola of Symphony Nova Scotia and Viola Fellow with the New World Symphony. He has served as Principal Viola under Michael Tilson Thomas, Bernard Labadie, and Lorin Maazel among other renowned conductors. Summer festival appearances include Manchester Summer Chamber Music, Verbier Festival Orchestra, Castleton Festival, Tanglewood Music Center, and Spoleto Festival USA. 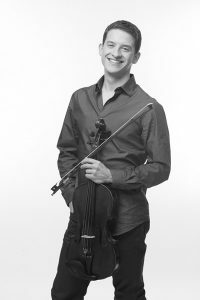 Recipient of the Horace and Marie Arnold Viola Award, Mr. Kavalo earned his bachelor’s degree at the Cleveland Institute of Music under the tutelage of Lynne Ramsey and Jeffrey Irvine. Mr. Kavalo enjoys reading books about food, working out, and drinking obscene amounts of coffee.